When choosing a family pet parents of youngish children might consider that a cat is the safer option. Everybody has heard or read stories of vicious dog attacks, right? Though aggression in cats is actually quite common it doesn't tend to have sell newspapers so parents may not be aware that it is as important to oversee a child's interaction with a cat as it is to keep watch when it plays with the family dog. Aggression in cats can be caused by fear, over-stimulation (petting or play) or redirected annoyance and frustration induced for example by the cat observing a strange neighbourhood cat, trespassing on its territory through a closed window. Fear-aggression where children and cats are concerned can be brought about by the child being too rough with the cat or kitten. If the child habitually plays too roughly, pulls the cats tail or like my son insists on lovingly squashing the cat in a bear hug, not surprisingly the cat may eventually lash out in fear of getting hurt again. Redirected aggression can seem to spring from nowhere. Perhaps your cat is sitting at the window and as you pass by he lashes out at you. Actually, he wasn't mad at you at all but at the feline he saw sauntering by outside the window. Prevented from dealing with the intruder gato a gato, your beloved feline friend just took his annoyance out on you. Watching two kittens roll about the floor, bunny kicking and biting each other, you would not think of them as being aggressive. Engaging in pretend hunting and fighting games kittens are how they learn and practise skills that are essential for their healthy development. That is of course all very well for a furry bundle of littemates but when your cat or kitten decides to play fight with your foot, those teeth and claws hurt! 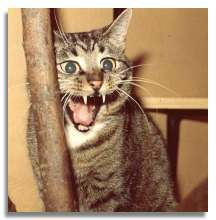 Overly aggressive play is often seen in cats who have been left alone for most of the day. Perhaps with their owners out at work or off to school and confined to home, they are under-stimulated and bored. You can address this by ensuring your feline friend gets plenty of play-time whilst discouraging him from considering any part of your anatomy a toy. Having one kitten who takes enormous pleasure in slinking along the back of the sofa and pouncing on the back of my head when I am vegged out watching t.v., I can vouch for the soundness of this advice. The last form of cat-owner aggression and certainly one you will want to watch out for with children is petting-aggression. If you have ever sat quietly reading a book while you absently stroked the cat in your lap only to receive a swift scratch or bite, then you have been a victim of petting aggression. All other forms of aggression seem fairly logical in that we can understand the impetus of the attack - fear, over-excitement, redirected anger - but petting aggression is different. What would cause a cat who is settled happily in his owners lap to suddenly lash out? No-one seems to know. Whatever the reason, petting aggression is avoidable. Cats give off clear signals when they are getting rattled and a petting aggression attack is imminent. Growling is kind of hard to misinterpret of course but you might also watch out for a twitching tail, ears laid back and that peculiar fixed, glassy-eyed stare. If you are sitting with the cat on your lap, simply stand up and let him roll off. Teaching your kids to watch out for these signals will prevent them getting a sharp bite or scratch. Cat bites are both very painful and have a high risk of becoming infected so should be avoided at all costs. Nevertheless, as a mother of two small children, I understand completely that it the proof is almost always in the pudding. After weeks of extricating an over-excited kitten from my son's sweaty clutches and repeatedly showing him how to hold the little cat gently, it wasn't until he received a scratch on the back of the hand that my boy learned respect for little teeth and claws.